Reduce drought and save on water. Ryno Lawn Care uses Hydretain to keep your lawn looking healthy and beautiful. Neither a wetting agent nor a super absorbent polymer, Hydretain is a revolutionary new chemistry designed to reduce the watering requirements of plants and turf. A patented blend of liquid humectant and hygroscopic compounds attract free water molecules from the air within the soil matrix, acting like tiny water magnets. This vapor would otherwise be unusable by plants and eventually lost to evaporation. 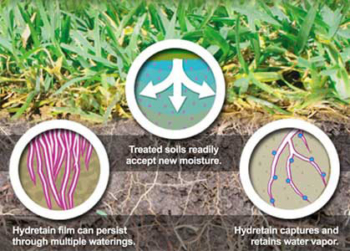 Hydretain aggregates this moisture back into a liquid form, efficiently transferring it to plant roots. Through this simple mechanism Hydretain not only helps keep plants clear of daily wilt cycles and drought, but it also contributes to more complete usage of water applied by rainfall and irrigation. This all translates into water conservation, reduced costs and labor, and healthier more vigorous greenery. Give us a call today to schedule your next Hydretain treatment. Does Hydretain Actually Work? Click Here to Find Out.